ZAPKUT GETS ME HOME FOR TEA! Like many in the trade, Jason Pumford gained his experience and skills working for others, but about eight years ago he took the opportunity to set up his own joinery business, JP Joinery in Flintshire. Initially specialising in custom made quality joinery, the business has since moved into high quality kitchen and bedroom furniture, with an extensive use of veneered panels, all of which were originally processed on a table saw. Having worked with vertical panel saws in the past, Jason knew the space and operational advantages these offered, but with the business being a small family operation he could not justify the cost of a machine from one of the major manufacturers. 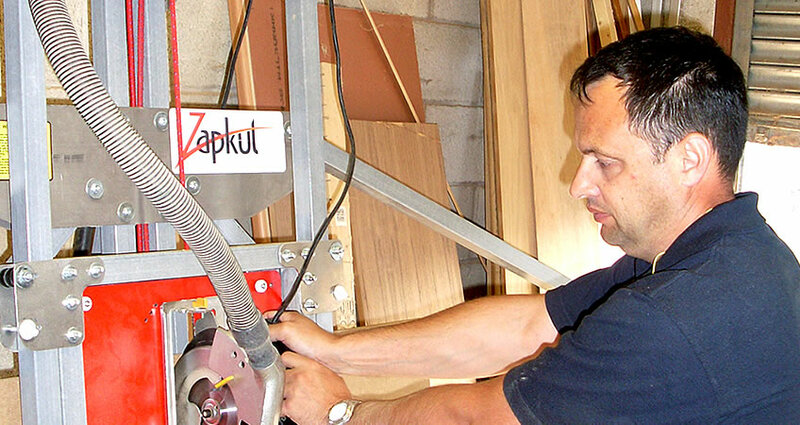 It was whilst searching the Sagetech website (www.sagetech.co.uk, specialists in vertical panel saws for the smaller business) that Jason came across a link to the Zapkut, produced by Sagetech’s sister company. This unique unit is the only truly folding, portable vertical panel saw system available on the world market. It was at that point that “the lights came on” and Jason realised this was answer he was looking for, particularly as initially he had been wanting to be able to cut out on site, where the previous method of laying a sheet on skids on the floor could not generate the accuracy he needed. Whilst the initial plan was to use the unit out on site (Jason finds that he can fold the unit very quickly and easily and put it into the back of his van), now he has relocated it in the workshop as he found it so much easier to pre-cut everything prior to transport to site. With the unit being so compact, it has also benefited him by reducing the amount of material movement he has to do. Indeed on one recent major contract, the saw has cut the material handling to around 40% of that with his past equipment. The other principal benefit is that the sheets that he uses were just too heavy to handle on his own on the table saw, but he can now process them entirely on his own with the Zapkut. Jason is full of praise for the Zapkut. When talking about Zapkuts accuracy he uses just one word – “brilliant!” … and “hands down, it’s lots quicker than it was before”. As he explains, “the work is being done a lot quicker and now I am getting home in time for tea!…. indeed it has been benefits all round, and I haven’t found a downside at all; I’m really pleased with it”. Jason is also very complimentary of his dealings with Zapkut Limited, as there were delays for health reasons from his side in being able to take delivery, and he was grateful for the way Zapkut understood his problems during a difficult time, taking care of everything and keeping him advised when delivery was finally transacted. “Zapkut is one of the best companies I have had dealings with over the last eight years”.